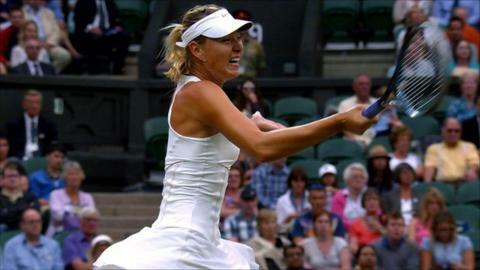 Maria Sharapova is enjoying being back in contention for the Wimbledon title as she prepares to face wildcard Sabine Lisicki in Thursday's semi-final. Having recovered from a career-threatening shoulder injury, the 24-year-old has made it into the last four for the first time since 2006. "I would have loved for it not to have taken this long, but I'm not complaining," said the 2004 champion. Victoria Azarenka plays Petra Kvitova in the other ladies' semi-final. Sharapova has won two other Grand Slam titles - the 2006 US Open and in Australia in 2008 - but says winning Wimbledon again would be extra special, and mark the end of a massive journey following major shoulder surgery in 2008. "It would absolutely have more meaning," said the fifth seed from Russia, who has not dropped a set so far this fortnight. "I have been in a situation where I didn't know if I was ever going to play as a professional at a very high level again." Despite her relative youth, Sharapova could be seen as a grizzled veteran compared with her fellow semi-finalists, who are all only 21. But she doesn't see it that way: "I think a few years don't really make that much of a difference. "I had my success really early in my career, and I don't regret it for one second. If I achieved big things when I was a little bit older, maybe I wouldn't be seen as more of a veteran. I'd still be considered young." Like Sharapova, big-hitting Lisicki has also had her share of injuries. After reaching the quarter-finals here in 2009, an ankle problem sidelined her for five months, and saw her world ranking fall to 218. But she has continued the form that saw her triumph on grass at Edgbaston earlier this month and is guaranteed to return to the top 40 at least. Lisicki said: "I have absolutely nothing to lose. I'm here as a wildcard. I'm here in the semis. I'm going to go out there and fight and give it all I have." Kvitova, the eighth seed from the Czech Republic, reached the semi-finals for a second successive year after dispatching Tsvetana Pironkova. She meets Azarenka, the world number five from Belarus, who is making her first appearance in a Grand Slam semi-final.